"A Second Chance for Europe" is badly needed! "A Second Chance for Europe" is badly needed! “A Second Chance for Europe” is badly needed! Jo Ritzen is a professorial fellow in the International Economics of Science, Technology and Higher Education at UNU-MERIT and the Maastricht Graduate School of Governance. He is a former Minister of Education, Culture, and Science of the Netherlands, served in the Dutch Cabinet at the Maastricht Treaty, a former Vice President of the World Bank and former President of Maastricht University. Ritzen is also a Fellow of the Global Labor Organization (GLO). His book draws on collaborations with various joint chapters co-authored by GLO President Klaus F. Zimmermann (Princeton University, UNU – MERIT & Maastricht University), and GLO Fellows Martin Kahanec (CELSI and Central European University, Budapest) and Pedro Teixeira (University of Porto and CIPES). This book calls upon us to rethink and reboot the European Union. The authors dissect the EU’s many vulnerabilities: how some Member States are backsliding on the rule of law, freedom of the press, and control of corruption – and how globalization’s ‘discontents’ are threatening the liberal international order. It examines the need for a common immigration policy; the need to rethink the unsustainable debt overhang of some Eurozone countries; and the need to use education to foster a European identity. Given the sum total of these vulnerabilities, the book argues, the EU may not survive beyond 2025 in its present form – that is, unless decisive action is taken. 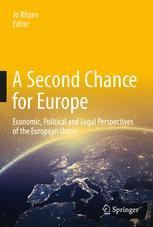 In turn, the book puts forward a number of workable solutions: a European economic model to secure full employment; a stronger European Court of Human Rights to counter systemic violations; a points-based immigration policy; clear exit options for the Eurozone; and an Open Education Area with a common second language. These solutions may reduce the number of EU countries, but would increase cohesion and overall survivability. The stark reality is that the EU, in its present form, is unlikely to survive the next 10–25 years. The EU of today, which provides for long-term peace and prosperity, faces an existential threat linked to recent voting in elections and referendums. Euroscepticism appears to have almost doubled in the period 2006–2016, from roughly 12% to 30% of the population (although Eurobarometer’s measure of Euroscepticism, at around 16%, has been more or less constant since 2011). These are EU citizens who do not believe that the EU has been good for them or their country. Many among them are likely to be the “losers of globalisation”. They are people who are uncertain of the future, for themselves or their children. A statistical analysis of Eurosceptic data highlights future uncertainty as a likely source of resistance to the EU. Euroscepticism has become visible in referendums on Europe; most notably with Brexit. There is therefore a need to realign the direct democracy of referendums with the indirect democracy of parliamentary representation; that is, if the EU is to serve its purpose as a “machine” for peace, security and welfare. The bottom line is that without further action Euroscepticism as a major “centrifugal” force is likely to increase in the years ahead, potentially giving rise to more exits or a complete and chaotic end to the EU. We sketch a visionary strategy for Europe in which full employment is quickly regained, where income inequality is reduced and the economies are more sustainable. We name this scenario “vibrant.” It is contrasted with what would happen if present policies continue within the European Union (EU) and its member states. In the vibrant scenario, full employment is regained by more policy attention toward innovation and its underlying research and development (R&D), accompanied by more labor mobility within and between EU countries, in combination with a selective immigration policy based on labor market shortages. The road to full employment is embedded in a landscape with less income inequality and more “greening” of EU member states’ economies. More trade can be compatible with this scenario. We translate the vibrant scenario into policy proposals distinguishing between the role for the EU and that of the member states. The free movement of people and workers is one of the cornerstones of the EU. Intra-EU mobility has overwhelmingly benefited the citizens of EU member states, both in countries of work and countries of origin. Early concerns in destination countries about welfare migration and the crowding out of less-educated workers have been broadly refuted. However, EU mobility policies still need a significant deepening and upgrading to deal with special cases of fraudulent contracts and crowding out in sub-sectors. What remains difficult is the full integration of some groups of mobile EU workers because of linguistic and cultural barriers. There is also a new challenge to EU policy: the integration of circular migrants. Here EU countries should be encouraged to harmonise administration and cut red tape. Europe and the European Union are close in values, in culture and in attitudes. Yet the EU has made little attempt to jointly reinforce the emotional attachment to Europe. Member States stress their differences in national identity through education and language. When the EU made the borderlines between European countries less visible, the language boundary remained, standing in the way of easy communication between citizens of different EU countries. We advance the “Learning Union” as a necessary complement to the EU. The Learning Union has three components: contributing to a sense of European belonging, the “communication EU” as well as the “competency EU”. Belonging should be reinforced by aiming the content of education at underlining the common heritage, history and the common future. In communication every EU citizen should learn in school to be competent in one common European language (English is the likely candidate), next to one’s own language. Competency is essential for competitiveness. Competency is bred by learning in settings decided by pedagogics, not by (the whims of) well-meaning politicians. The Learning Union is at “arm’s length” distance from Governments with autonomy and funding designed to incentivize learning goals as well as equality of opportunity. 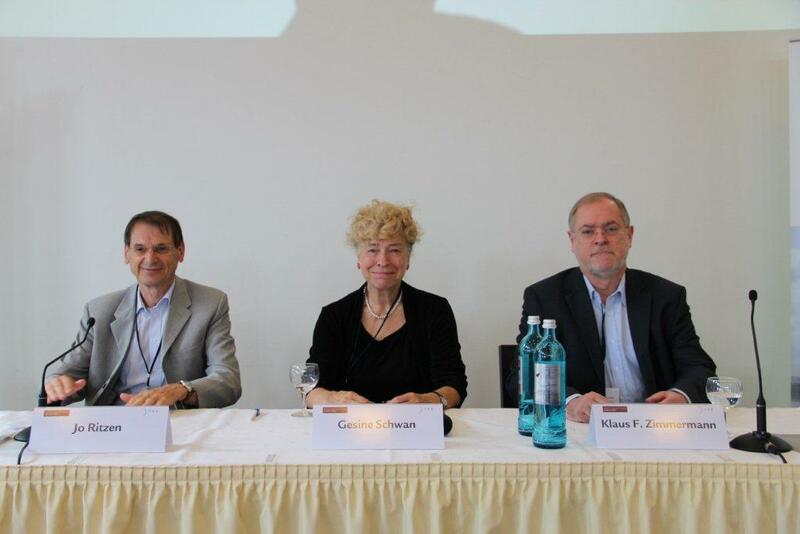 Picture below: Gesine Schwan, Jo Ritzen and Klaus F. Zimmermann debating the future of Europe and its labor markets at a conference in Bonn on July 17, 2013. One of the many joint activities preparing the book. It was Jo Ritzen who early on anticipated the upcoming crisis of Europe and its institutions. Gesine Schwan is a German political science professor, former President of the Viadrina European University, and member of the Social Democratic Party. Her party had nominated her twice as candidate for the German federal presidential elections.